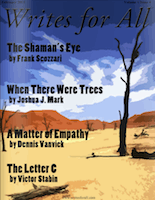 Writes for All is an independent publishing company seeking fiction of the highest quality. Our magazine is available free online and print publications may be purchased through our online store. Our mission is to publish meaningful stories that explore the human condition regardless of genres, sub-genres, and styles. We strive to break down the barriers of fiction and publish works that tackle a variety of subject matters. We are open to short story submissions of all kinds, whether they be Literary, Romance, Science Fiction, Mystery, Thriller, Horror, and others. We find it improper to disqualify work based on preconceived notions of form within a category. We understand that there are many ways to tell a story. We believe that work of merit transcends the genre in which it is associated.